Beds, blankets and baby milk reach refugees forced to flee ISIS in Syria and Iraq, courtesy of IsraAID. IsraAID, the first Israeli aid agency to take part in relief efforts for Kurdish refugees in northern Iraq, is set to continue its work helping victims of the brutal Islamic State (ISIS) organization. 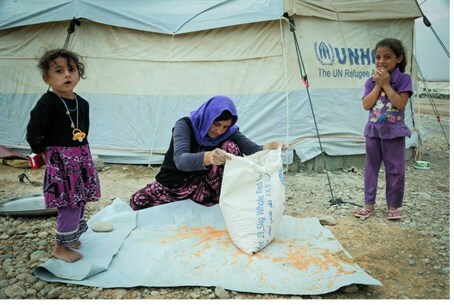 Earlier this month, the NGO supplied beds, blankets, and food to over 1,000 families in the Kurdish city of Duhok, in northern Iraq. The emergency aid was dispatched to help refugees - many of them Christians and Yazidis who have faced the gravest threats from ISIS's bloody military campaign - with the onset of the notoriously harsh winters of the Kurdistan region. Israeli aid workers were well-received. "They were aware that we were Israeli, and they received us very well. The Kurdish people really love Israel," said IsraAID's Founding Director Shahar Zahavi, who added that more aid was on the way. "We are planning for the harsh winter coming, and alongside the international aid community we are preparing special winterized clothes, blankets, gloves and more. "Israel's dedication to reach out to the other has no limits or borders. As Jews we are obligated by tradition to care for the other especial those persecuted unjust fully."